Of the many things i could offer up about Trumpism since we were last online, I’ll bring up this because I do not see it has gotten any play in the media (yet). "This proposal is a shameful betrayal of children. This administration and congressional Republicans passed a massive tax giveaway to their donors and big corporations, and now they want vulnerable children to pay for it." 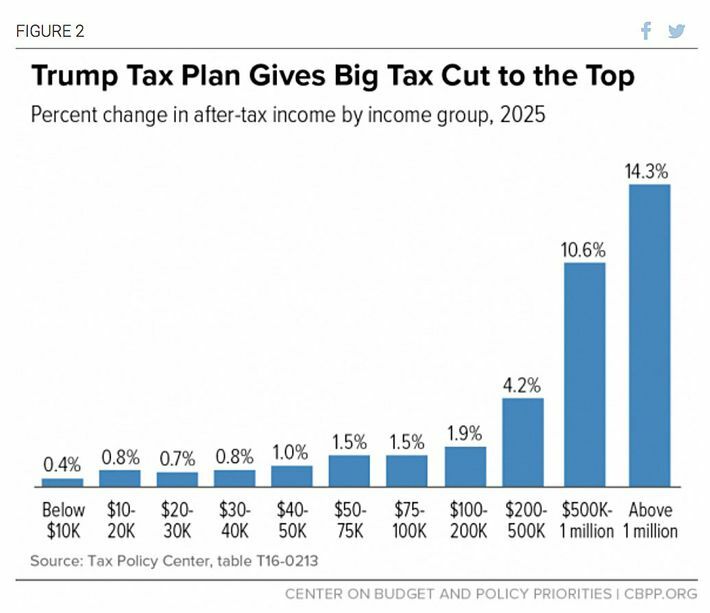 Most all of the tax cuts (~$150B/year) goes to rich people and to corporations. Now these spending cuts will go to young families trying to keep their children healthy. So, what pushes news that Trump is dumping the Iran nuclear agreement, and now making it possible for Iran to fire up its reactors and start manufacturing a weapon, off the front pages? The fact that the Russians followed through on the "collusion" with Trump, and started putting money in his bank account. Yes, it is that bad. No, you can't make this stuff up. It is, but it's not your choice or mine. Also, working in the non-profit sector (aka church) means that my kids also chose to be less than rich. Trump has never been in the real world in his life. Maybe I've assumed too much over the years - you do realize that if almost 50% of households pay almost no personal federal income taxes, it's hard to give an income tax cut of any significant size to someone who doesn't pay taxes or pays very little in them? A simple $9/month tax cut to someone who might pay $500 in federal income tax is a 20% reduction in taxes. For some context, the top 1% of incomes earners pay 37% of federal income tax. The top 3% of earners pay 51%. The top 25% of earners pay 86% (should be 2012 or 2013 stats if I recall correctly). How much does your household have to make to be in the top 25% of households? $85,400. That would be a two-couple household making about $42,000 each. Also note that those percentages regarding income don't change depending on where you live, so I'm sure some folks in NYC and San Fran making $200k or more a year don't think of themselves as "the rich" or the "evil 1%", but they are. When the politicians talk about raising taxes on "the rich", my friends, they mean you. Ed: Work is not the only way to have income I haven't had a job for several years but that does not mean I have had no income nor paid income tax. ET wrote: Some 50% of households pay 2% of federal income taxes while the top 1% pay around 37%. Lot of moochin' going' on. My impression is that the majority of that top 1% got there (and are able to stay there even when they contribute heftily) mostly by a combination of mooching and skimming, the source being the labor of a significant portion of tha middle 50%. The scale of the upper crust's mooching and skimming puts that of the welfare bums to shame. My impression is that the majority of that top 1% got there (and are able to stay there even when they contribute heftily) mostly by a combination of mooching and skimming, the source being the labor of a significant portion of the middle 50%. The scale of the upper crust's mooching and skimming puts that of the welfare bums to shame. Ed: Hauro would you put a definition to your phrase "mooching and skimming '' ? I am persuaded many of the upper 1% got there and have stayed by diligent application of their God given skills, knowledge and abilities. Some inherited their way into this small group and have stayed, the same way and others have squandered it away. I am also persuaded that there moochers at every level. If you really want to research this, and find out exactly what the upper 1% wind up paying, not just theoretically according to the structure, but in actual dollars, you have to dig into the exemptions and loopholes that don't kick in until you get to the higher brackets. A person can sustain a one year loss of, say, $1 million, spread that out across the income tax returns for the next decade, and wind up paying zero tax, even if he earned it back across the course of that decade. And you can see a bit of inequity in the fact that while the top 1% pays a theoretical 37% of the tax, depending on who you cite, they earn over 80% of the income. Discussions on this board related to income inequity, taxes and similar matters, from the conservative side, always seem to weight heavily in the favor of the wealthy, who are perceived as entitled to their wealth, and never to be held accountable or responsible for having it. Maybe there's a bit of reticent belief, misinterpreted Old Testament holdover, that wealth is a sign of God's blessing, at least for males. The Bible is the verbally, plenary inspired, inerrant, infallible, literally interpreted word of God except for select passages of Matthew 5-7, Matthew 19:16-22, Mark 10:17-22, and the better portion of Acts from chapters 2 through 7, and a few other places here and there. Sandy wrote: The Bible is the verbally, plenary inspired, inerrant, infallible, literally interpreted word of God except for select passages of Matthew 5-7, Matthew 19:16-22, Mark 10:17-22, and the better portion of Acts from chapters 2 through 7, and a few other places here and there. We are all selective literalists. Some of us are just willing to admit it. Dave Roberts wrote: We are all selective literalists. Some of us are just willing to admit it. Amen to that as well. I’ll add one has to be somewhat selective since the Bible does not speak in unanimity. I let the Spirit of God sort it out (best I can with prayer) - it is after all the source of “all truth”. KeithE wrote: I’ll add one has to be somewhat selective since the Bible does not speak in unanimity. Looks to me like openbible.info doesn't winnow in unanimity, either. How does that website decide which verses to cite under which headings? There are several in the wrathful column that look to me at least as well suited to the love column.